The pace of home building picked up in June. According to the Department of Commerce, housing starts were on a 1.2 million-unit annual pace, up for the first time in four months. The rate was higher than analysts anticipated, up 8.7% from May and up 2.1% from the year-ago pace. 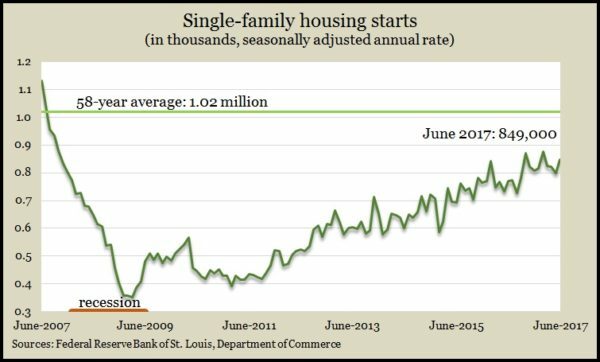 Single-family housing starts – which account for about 70% of the overall activity – rose 10.3% from June 2016 but still lag the long-term level of new house construction. The same report showed a better-than-expected increase in the rate of building permits issued, suggesting the housing recovery still has more wind in its sails. Real estate professionals and housing economists have pointed to a shortage of homes to sell. The moving four-week average for initial unemployment claims fell for the first time in three weeks and only the second time in eight weeks. Still, the leading indicator of firings and layoffs remains 32% below the 50-year average, where it has been hovering each week for more than four and a half years, according to Labor Department data. That suggests employers continue to be reluctant to let workers go, which strengthens the labor market. The Conference Board said its June index of leading economic indicators suggests continued moderate economic growth at least through the end of the year. The pickup in building permits after months of weakness combined with broad improvements among the indicators. The business research group said economic growth might even accelerate past the 2% rate. The June index rose 0.6% from its May reading, beating analysts’ expectations.